Kimble joined the ATA Comp Fund as its Chief Executive Officer in December of 1995. As CEO, he continues to oversee the expansion of the program from its beginnings to its current annual revenue. 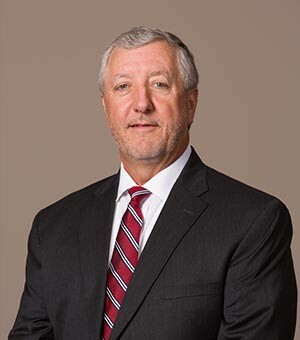 He graduated from Auburn University’s School of Accountancy and obtained his Certified Public Accountancy Accreditation in the State of Alabama while practicing with the firm of Carr, Riggs and Ingram, LLP. His primary expertise while practicing were nonprofit entities, trade associations and association-based self-insurance programs. Prior to the Fund, Kimble was Vice-President of Administration with the Alabama Rural Electric Association and established and administrated their self-insurance program serving their 23 Electric Utility Cooperatives. Kimble has served as a Board Director to many various organizations over the years, which include Rotary, Project Share, Trucking Association Insurance Council (TAIC) and the Self Insurance Institute of America (SIIA), where he also served a term as their Chief Financial Officer. Kimble and his wife, Sandy, have three daughters: Katie and twins Kathryn and Caroline. As avid sports fans, the entire family attends as many athletic events as possible for their favorite college sports teams at Auburn University.